“We were offered screening for Down’s syndrome and initially agreed to have it. Due to my high BMI and the position of our baby the normal NT measurements could not be assessed. We were offered additional screening, but we turned it down, saying that no matter what the result was it would make no difference. Tilly is now three months old and I thank my lucky stars nearly every day that we made the decision not to have further testing. Had we done so, there was a risk that we could have decided to terminate – which would have been an absolute tragedy – or we would have had the fear hanging over us for the rest of the pregnancy, which would not have been good for our baby. So when it came to giving birth, the thought that our daughter could have DS was niggling in the back of my mind, but was a tiny, tiny concern. 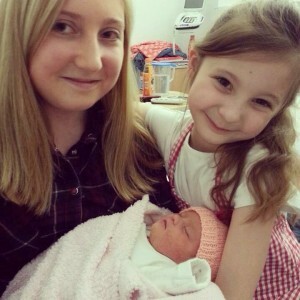 I was more worried about our eldest being in school and who was picking her up, since I was in hospital for three days being induced before Tilly was born. Immediately after I delivered her and the midwife handed her to me, I immediately saw the almond shaped eyes and I knew. I knew the perfect little girl I had dreamt of for nine months at least, was not being handed to me. I knew our daughter had Down’s syndrome. The emotions at that immediate point in time were immense and all valid and allowable. I felt grief for the little girl I had dreamt of; fear of the unknown; betrayal that this should happen to me (after years of trying for our first and a miscarriage); that I had let my husband and my family down; and disappointment that our perfect future had dissolved in that moment. But overall, the same as any mother of a new-born baby, I felt love. Please believe me, that love has grown and overcome all of the other emotions a thousand times in the three months since Tilly was handed to me. 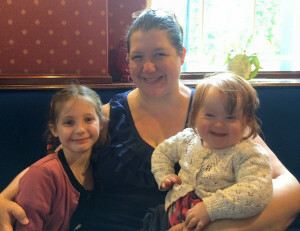 The registrar who delivered Tilly agreed there were some outward markers that she could have Down’s syndrome. They said they would take a blood test the next morning – with the results being available four days later, as it was the weekend. But to me there was no doubt. 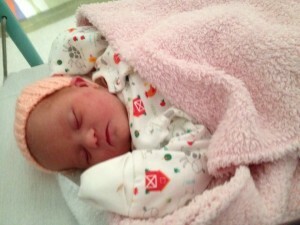 My husband and I talked about announcing Tilly’s birth to the family and what would we say? We agreed to just be up front about it. We had delivered a beautiful little girl, 6lb 3oz, and she had Down’s syndrome. He then left the hospital as it was late and I was alone on the postnatal ward with our daughter. We were pretty much left hanging until the results of the blood test four days later. A registrar came to see us and told us the result we already knew. By this point my husband and I had had time to come to terms with it all. 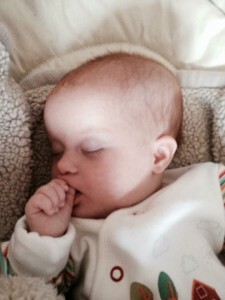 We had announced Tilly’s birth on Facebook, along with the probability that she had Down’s syndrome. A very old friend of mine was also friends with someone who was involved in the Wakefield & District Down’s Syndrome Support Group. She had asked her if it was okay for me to get in touch; so I had, in a round about fashion, made contact with a strong support system. I was lucky to have the contacts I needed for this to be possible. So when the registrar gave us the results our response was pretty much, okay, so now what? He told us there would be a team of carers looking at her development and that she would be supported all the way. He told us she would need a heart scan, but didn’t really make it clear why and gave us the appointment. He handed us the Down’s Syndrome Association leaflet and left. With this we were discharged. That’s when it all became so hard. I began to research, as anyone does these days – reduced life expectancy; increased possibility of some type of cancer; definite learning delay; and other stuff.. I cried all night. I later found out my husband did too. Tilly had the heart scan the following week and luckily had no major defects. At this point we did not appreciate how huge a deal this was – it would have been nice to know. We are now learning as we go along – mainly from networking with friends and groups on Facebook, which is a shame. Personally I feel Tilly’s care should be driven by healthcare professionals; although I concede there are a lot of conditions out there and no one person can know everything about all of them. For example, Tilly has bad reflux, to the extent she had a bad choking session and was blue-lighted into resuscitation, then admitted overnight onto the children’s ward. She was discharged the next day with a few sachets of Gaviscon to help the reflux and a promise to chase up her appointment with the speech and language therapist. Had she not been admitted I don’t know how long she would have had to wait for this appointment. She has no appointments for physiotherapy or occupational therapy. I don’t know if she needs them, because she isn’t being seen by anyone. Her paediatrician appointment isn’t for another five months. We don’t know what is acceptable and what is not – we have to rely on the responses of our peers on Facebook and at the support group. Tilly still has minor choking episodes due to reflux which is caused by lack of muscle tone in her gut, but no one is monitoring this other than us. What would be helpful and reassuring as parents leave the hospital, following a diagnosis of Down’s syndrome, is a clear plan of action. We should be told who will be the paediatrician in charge of co-ordinating our child’s care. We should know how long we will be waiting for appointments, so we are not left in the dark wondering. And we should be offered contact details of support groups and people available and willing to help – leaving it up to us to contact them. We should be told that there is a lot of information available on the internet (most of it scary) and be given details of where to find not only the hard facts, but also positive stories of what children and adults with Down’s syndrome are achieving.